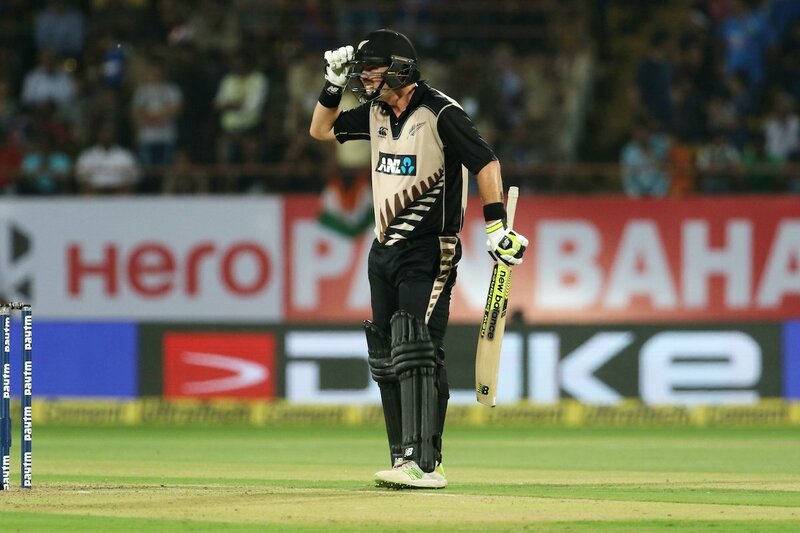 Rajkot, Nov 4: New Zealand dominated with both bat and ball to defeat India by 40 runs in the second Twenty20 International (T20I) at the Saurashtra Cricket Association Stadium here on Sunday. The Kiwis, who had lost the first match by 53 run in New Delhi, have now levelled the three-match series at 1-1. Opting to bat first on winning the toss, the visitors rode on an unbeaten quickfire century by opener Colin Munro to post 196/2 in their allotted 20 overs. Munro batted through the innings, smashing 109 runs off 58 deliveries. This is his second century in 34 T20Is. In reply, the hosts could only manage to post 156/7. Fast bowler Trent Boult was the pick of the New Zealand bowlers with figures of 4/33. Chasing a stiff target, India suffered a big setback in the second over of their innings when Boult sent back openers Shikhar Dhawan and Rohit Sharma. Shreyas Iyer and Hardik Pandya also returning to the pavilion in quick succession, leaving the hosts struggling at 67/4 in the 10th over. India captain Virat Kohli and Mahendra Singh Dhoni tried to stem the rot with a 56-run partnership. Mitchell Santner however, an end to their chances when Kohli stepped out of his crease, only to hand an easy edge to New Zealand wicketkeeper Glenn Phillips. Earlier, New Zealand rode on Munro's power packed batting to post a big total. Martin Guptill, the other Kiwi opener, also batted well, scoring 45 runs off 41 balls. The Indian bowlers did not exactly cover themselves in glory, with only debutant pacer Mohammed Siraj and leg-spinner Yuzvendra Chahal bagged a wicket each. Siraj was at the receiving end of a lot of punishment from the Kiwi batsmen during his first match at the international level. The 23-year-old from Hyderabad was the most expensive Indian bowler on Saturday evening, giving away 53 runs in his four overs, although he managed to bag the wicket of Guptill. Chahal was the only other Indian bowler who managed a wicket, returning figures of 1/36 in four overs. Medium-pacer Jasprit Bumrah also bowled well, conceding just 23 runs in his four overs. He had a good start to his spell, giving away only nine runs in his first two overs. Munro and Guptill gave the Kiwis a flying start with an opening stand of 105 runs in 67 balls. Munro raced to his half-century in just 26 balls, bringing up the landmark with a six off Axar Patel over long on. He then made good use of a couple of narrow let offs to reach his century in 54 balls. 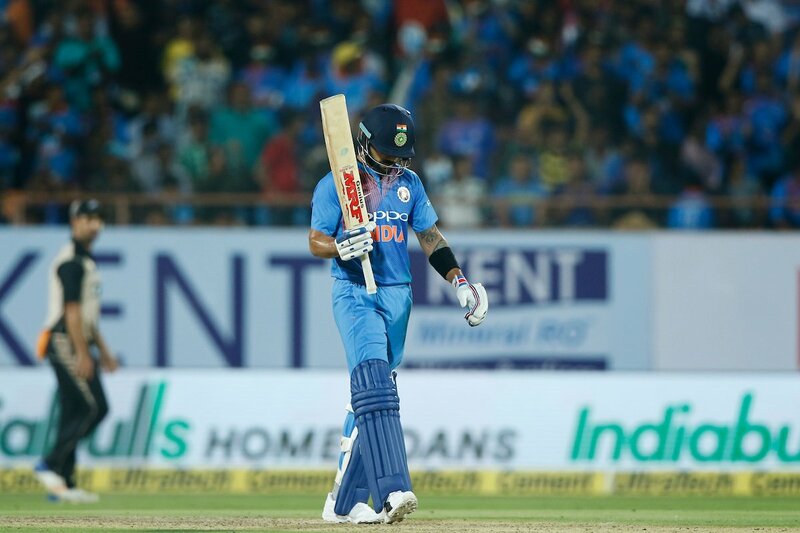 Opening the bowling for India along with Bhuvneshwar Kumar, Siraj's very first over in international cricket saw him concede 10 runs, including two boundaries. He copped even more punishment in his second over with Munro smashing a couple of sixes. Chahal also had a poor start to his spell, giving away 17 runs in his first over. He continued to leak runs but finally had his revenge when Guptill was outfoxed by some extra bit of spin and was caught by Pandya at long off just five runs short of his half-century. New Zealand captain Kane Willamson was dismissed a short while later when a mistimed shot off a half-volley by Siraj found its way to Rohit Sharma at deep mid wicket. Munro was handed a let-off while on 79 when he was dropped by Chahal off Bhuvneshwar's bowling at deep cover. The Kiwi left-hander promptly punished the hosts for that folly, going on to hit a couple of boundaries later in the over. Munro had a narrow escape only a couple of overs later when he nicked a slower delivery from Bumrah but the ball did not have enough pace to carry over to Dhoni behind the stumps. The hosts had to pay for those mistakes as Munro and Tom Bruce carried the visitors close to the 200-run mark by adding 56 runs between them. Bruce remained unbeaten on 18 runs off 12 deliveries.